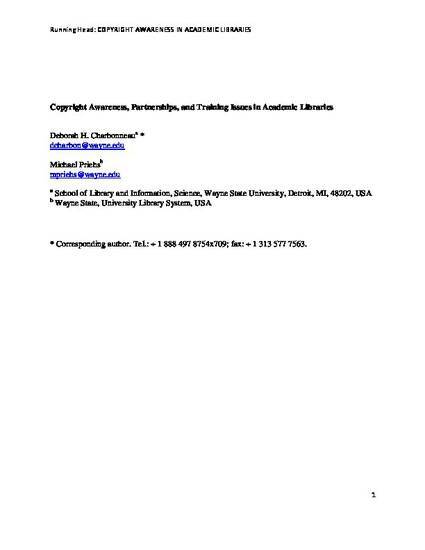 This article reports on the results of a national survey of academic librarians and library staff (N = 226) in the United States about their awareness of various copyright policies, partnerships with campus groups to address copyright issues, and training needs. A majority of the survey respondents reported that they have answered copyright-related questions in the workplace, yet only 49% (n = 98) of the respondents perceived they were prepared to provide copyright information to library users. Awareness of various copyright policies among librarians and staff members varied, including a reported minimal awareness of the T.E.A.C.H. Act. In addition, survey respondents expressed the desire for more copyright-related training. In light of these findings, the present study extends the existing literature and offers recommendations to help better prepare a “copyright confident” or “copyright responsive” academic library workforce. Charbonneau, D.H. and Priehs, M. (2014). Copyright awareness, partnerships, and training issues in academic libraries. The Journal of Academic Librarianship, 40(3-4), 228-233.